Back on MX-17 with a new computer, Intel rather than Ryzen and no GPU. I tried to install Compiz last time as well and totally stuffed it up. This time, I’ve tried to do it the MX way. I watched Dolphin’s Wiki video a couple of times, then used MXPI to install Compiz via Popular Applications – Window Managers. This time I got the Fusion icon into the panel with no problems but every time I change over to the Compiz WM, I end up with windows that don’t have the minimize/maximize/close window buttons that you need to play properly. I’ve looked at the manual but it only has one Compiz reference, I’ve checked the forums but haven’t found any answers, I’ve searched more generally online and while there are lots of references to missing window decorations, I just haven’t found any answers. Being a newbie, I’m sure it’s something stupidly simple that I’m missing or have done wrong. Thanks for any support, peoples. Make sure that emerald is installed. Then in a terminal type emerald --replace. To have this command load at start right click the fusion icon and pick settings manager. Then in effects find window decoration. On the left of the window enable window decorations and add to "Command" in the right pane emerald --replace. Once emerald is installed and the user enables "window decorations" using the setting in Compiz Settings Manager, can't you just right click on the fusion icon and choose "select window decorator" ==> emerald? Once done, it's a matter of opening emerald theme manager (also from right clicking fusion icon) to choose the emerald theme you like. What is important is to ensure that fusion-icon autostarts whenever you login to MX. So open the XFCE Sessions and Startup setting in the XFCE Settings Manager, go to the application autostart tab and add fusion-icon as an entry if it's not already there. Thanks for taking the time to answer, much appreciated :) Firstly, when I hit the Fusion icon in the panel, the Emerald Theme Manager is actually there. When I double-check in Synaptic, both emerald and emerald-themes are definitely installed. When I click the Fusion icon and select Settings Manager, if I go down to Window Decorations it is definitely 'ticked'. When I click on Window Decorations and it opens up, the command emerald --replace is already there. Yes, when I click on Emerald Theme Manager there are lots of options there which I assume I eventually need to select and import? However, I haven't done that as yet. I just clicked to change to Compiz as the Window Manager using the Select Window Manager option... which is when the window decorations all disappear on me. Am I actually 'required' to select one of the Emerald Themes and import it before everything actually works? I think the only time I've ever used Compiz before was when I was playing in Mint Mate one time... and it just kind of worked. Oh, the Compiz Fusion icon definitely isn't in the sessions and startup autostart tab. I just checked. Do I definitely 'have' to do that to also get Compiz and the Fusion icon in the panel to work properly? 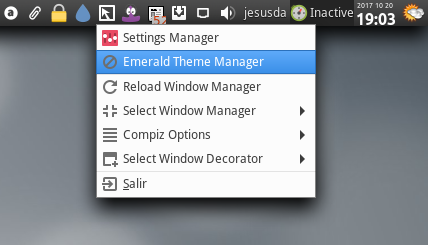 Just select any theme in Emerald Theme Manager and the window decoration changes immediately. The most "normal" ones IMO are numix or shiki colours. From within Emerald Manager you can modify them (e.g their colours) and then save the new version to another name. Search also for pintbluemix. 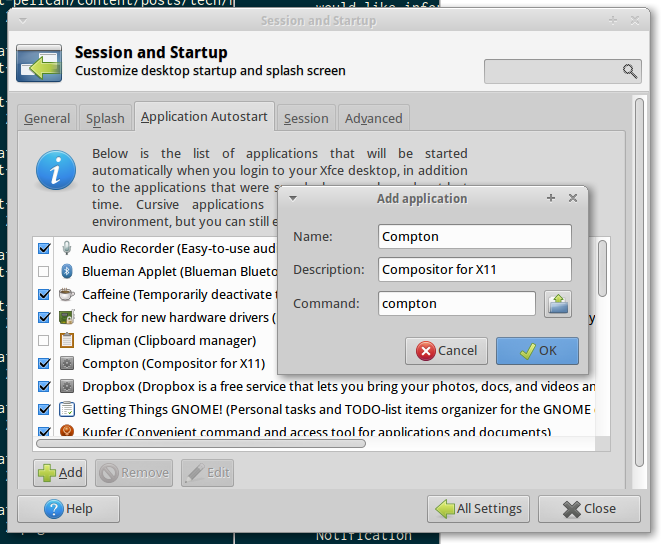 Compiz Fusion icon definitely isn't in the sessions and startup autostart tab. I just checked. Do I definitely 'have' to do that to also get Compiz and the Fusion icon in the panel to work properly? No, if fusion icon is set to autostart, it just makes it easy for the user to manage compiz (or switch back to xfce's window manager). If autostarted, your xfce session will start with whatever was the last window manager set in fusion icon, I think. Thanks, asqwerth... but at close to midnight, this sounds like a project for the morning lol. So, do you have to 'import' the theme you want? And then, if you decide you don't want it later, do you need to 'delete' or 'unimport' it lol? Those in Emerald Manager are all preinstalled already and in your system. Just click on the one you want. It's instantaneous. If you find stuff outside in the web, yes, you can import them. They come in files with the suffix ".emerald". We need a Wiki entry on compiz by people who know and use it, which I don't. .emerald files should also already be associated with the Emerald Theme Manager, so clicking one should open the theme in that application.